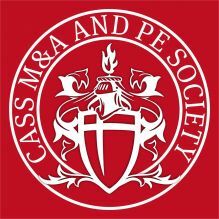 The Cass M&A and PE Society provides members with an insight into the world of deal making and the M&A process. Our regular events each year discuss industry developments, analyse the latest market trends and provide career advice to aspiring investment bankers from the industry's biggest recruitment specialists and leading corporate financiers. Our work is not solely restricted to M&A as we look to explore the wider corporate finance landscape and touch upon the fields of equity capital markets and other investment banking activities. Working side by side with the renowned Mergers & Acquisitions Research Centre (MARC), we bring together an exciting mix of academics and professionals. Our keystone event, the annual M&A Conference held in March, is the largest student-led M&A conference in Europe and has attracted speakers from firms including: Amadeus Capital Partners, Ardian, BC Partners, BlackStone Group, Citigroup, Credit Suisse, Deutsche Bank, Evercore, EY, HSBC, Goldman Sachs, Mergermarket, Shire, Société Générale. Visit the Clubs and Societies page and choose Cass M&A and PE Society from the list to join the society. The Cass M&A Society is happy to welcome all students to a presentation about current M&A development, the latest deals and providing tips for job opportunities. Students will have the opportunity to join them for networking. Please register here beforehand as the number of places are limited and due to the high level of interest, registration will be closed when the places are filled. The M&A Society, in conjunction with the M&A Research Centre, are delighted to welcome Sir Christopher Gent, Chairman of GlaxoSmithKline, to an evening event at Cass Business School on 18 November 2014. He will be sharing his wide experience of business after which there will be a Q&A session, chaired by Professor Scott Moeller, Director of the M&A Research Centre. There will be an opportunity to network over drinks and nibbles following the session. Sir Christopher became Chairman of GlaxoSmithKline plc on 1 January 2005 after joining the Board as Deputy Chairman on 1 June 2004. Sir Christopher has many years' experience of leading global businesses and a track record of delivering outstanding performance in highly competitive industries. He was appointed Managing Director of Vodafone plc in 1985 and then became its Chief Executive Officer in 1997 until his retirement in 2003. He was also Non-Executive Director of Ferrari SpA until 24 March 2014. Sir Christopher is a Senior Adviser at Bain & Co and a member of the British Airways International Business Advisory Board. Our keystone event, the annual M&A conference held in June, is the largest student-led M&A conference in Europe and has attracted speakers from firms including Amadeus Capital Partners, Ardian, Barclays, BC Capital Partners, BlackStone Group, Citigroup, Credit Suisse, Deutsche Bank, Evercore, EY, HSBC, Goldman Sachs, Mergermarket, Shire and Société Générale. This year's conference - co-hosted by the M&A Society and the M&A Research Centre - was held on 4 June. The evening began with a keynote address delivered by Anne Glover, CBE, CEO and Co-founder of Amadeus Capital Partners, and continued with two panels of experts, with topics focusing on the private equity industry, as well as on M&A pricing and valuation across sectors and regions. Philip Whitchelo, Vice President, Strategy & Product Marketing, Intralinks Inc. Please click here to see photos of the conference. The M&A Society together with their sponsor, Intralinks, hosted an event on the topic of M&A activity and trends. Speakers from Mergermarket, Intralinks and EY shared their views about current M&A activity and trends. Intralinks also presented their Deal Flow Indicator, which tracks early-stage M&A deals globally (sell-side M&A mandates and deals reaching due diligence), providing a unique leading indicator of global M&A activity levels. This event was tailored to give students an understanding of potential careers within M&A and what such careers entail. During the evening, the speakers gave their perspectives on the whole spectrum from origination (Ardian), transaction services (EY Transaction Advisory Services) and in-house M&A (Barclays). Presentations were given on how these organisations fit into the M&A environment, why students should consider a career within this field and what the 'day job' looks like. A unique opportunity to gain a better understanding of M&A and the deal making process. More information here. A discussion on the latest developments within the technology sector - more information and registration here. Think a career in M&A is only about IBD? Think again. More information and registration here. A unique opportunity to interact directly with the Global Editor-in-Chief of Mergermarket, Giovanni Amodeo - more information and registration here. Led by Director of M&A at Siemens AG, Markus Duschat, this exclusive workshop is for EMBA students - more information and registration here. The second annual M&A conference - more information and registration here. Andrew and Phill shared their insights into the latest corporate acquisition activities and the key issues of concern for private equity-sponsored deals. Meyrick Cox, Managing Director, Rothschild (24 May 2010). Meyrick spoke on the Geely-Volvo deal, from pitching to closing. Keri presented about his career as a corporate development specialist. In particular, he highlighted the differences and similarities between corporate development professionals and investment bankers.